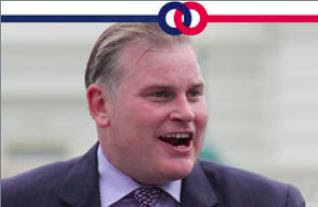 Who could possibly think that is the face of a con artist? 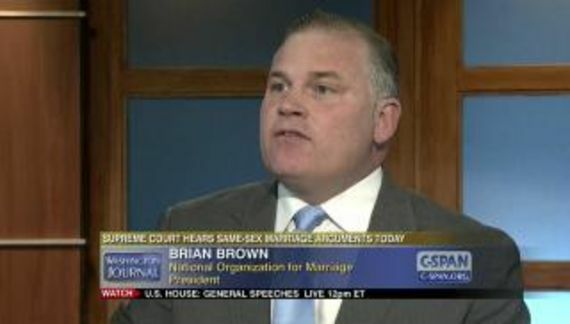 Brian S. Brown will make any claim, no matter how misleading, if he thinks that it will cause people to donate to National Organization for Marriage. The lies are necessary because NOM has no track record. …Masterpiece Cakeshop v Colorado Civil Rights Commission, deals directly with marriage and could provide the protection from persecution we've been fighting to achieve for many years. With his petty defensive quotes around the word wedding, Brown is only highlighting the failure of his organization to influence public policy. Marriage equality is the law of the land. The approval of neither Brian S. Brown nor the Catholic Church is required. I don't want to re-litigate this case but the New Testament also teaches: “Render to Caesar the things that are Caesar's; and to God the things that are God's.” Those words were from Jesus' own mouth. The fact that Brown sends out emails and writes blog posts claiming that the baker should not be required to obey the law does not morally entitle Brown to contributions. NOM has had no involvement in this case despite Brown's attempts to suggest otherwise. These arrogant people continue to insist that the exchange if any goods or services makes them participants in a ceremony that they disapprove of. Mr. Brown is not that important. Furthermore, the baker wasn't “targeted.” The baker is victimized by his own actions. He made the decision not to serve a gay couple. All they wanted was, in fact, a cake. Furthermore, for Brown to claim that expecting service in a public accommodation in accordance with applicable law is an extremist position is moronic and disingenuous. Expecting the teachings of the Catholic Church to be the law of the land is an extremist position. That might have been true 400 or 500 years ago in Europe but such desires directly conflict with our Constitution. That “important legal brief” was one of 95 amicus briefs filed in this case. It consists of 21 pages of actual argument and it was prepared by NOM director John Eastman. It was also filed jointly with the Claremont Institute. NOM's actual expense was probably trivial. Where did this “right” to refuse service contrary to applicable law come from? Can I find it in the Constitution? It must be there or is this just another example of Christian Privilege? There must be similar cases by Jews, Muslims, Buddhists and Hindus. No? Some people will believe just about anything voiced in a religious appeal. People can see for themselves — with a bit of curiosity — that NOM has nominal program service accomplishments at best and those do not correlate to program service expenses. Mr. Brown is shameless — and dishonest.